Heather Kalamaha - Mowbray & Son, Inc.
Heather Kalamaha is a native of Minot, ND. In 2003, she received a degree in Culinary Arts from North Dakota State College of Science. Heather worked a few years in the food industry before switching her career to business administration. 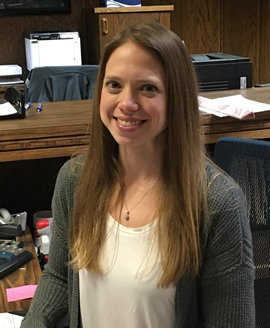 She worked as a Customer Service Representative and Administrative Assistant for a local furniture store for a few years and as an Assistant at Trinity Health. Heather joined the Mowbray & Son, Inc team in October of 2011. She was hired as a Service Dispatcher and Service Accounts Receivable. In 2013, Heather shifted areas to Accounts Payable and is the company’s Safety Coordinator.